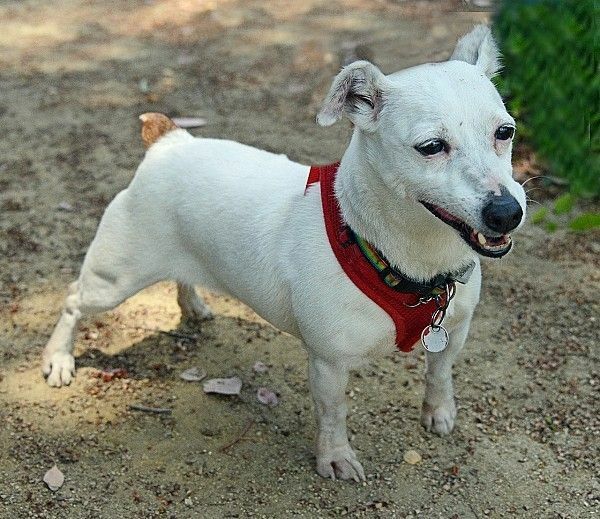 Roxxy is likely a Jack Russell Terrier Mix. She was born around July 2006. She weighs 12 lbs. If you are you looking for a running partner or a dog with which to do lure coursing or earth dog competitions, Roxxy may be the dog for you! She needs lots and lots of exercise. Then more exercise and lots and lots of training and guidance (to which she is quite responsive). Roxxy is very independent with (did I mention this already?) an extremely high activity level. She lacks K9 to K9 social skills. She’s scrappy, yappy and rude. She only manages to stay out of trouble with the most easy going, best socialized or biggest dogs. Dog parks will not be on the radar screen for her anytime in the near or far future. Harnessing her boundless enthusiasm and high play drive into something more then reactive energy will be both the challenge and the reward. While very dog savvy cats appear to be able to manage her behavior towards them, a kitty-free home would be best. Roxxy is crate trained. Training contract required. Note: Roxxy will not be shown at all pet fairs. Please let us know if you are interested in meeting her so we are sure to bring her on that date.